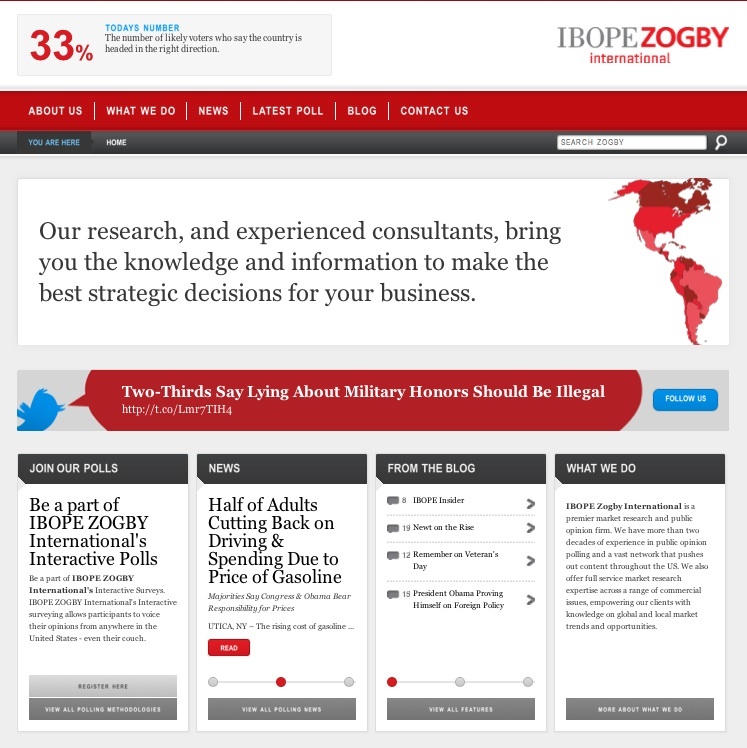 Launched in 1984 Zogby International (ZI) provides crucial information to business, government, and academia, including polling, surveys, market research, and political analysis worldwide, along with on-going PR and consulting activities. The website provides many products and services, such as specific newsletters, surveys, summaries of recent and archived polls, and reports conducted in several parts of the world with a special focus on US. The opening webpages feature little more than a collection of current news and soundbites, along with a summary of recent reports that can be purchased online. A much more comprehensive section (“Domestic”) covers the US political landscape, with several RSS Newsfeeds subscriptions, audio and video commentaries, online polls, and events lists. Another set of webpages are dedicated to interactive online polling, addressing the US scene in relationship to a wide range of topics. Taken as a whole, such website is then informative and relevant for PS studies worldwide, freely available to the users in the public pages and always current. Services and ad hoc polls can be purchased. A keyword search option is provided only in the Domestic area, where each page is also available in a printer-friendly format. No other help facilities or navigational tips are evident, thus resulting in a difficult level of usability for non-experts. are joint undertakings of institutions and/or persons sharing research projects and activities. In many cases, thematic networks coincide with professional research committees; or may be based on research groups or labs formed to develop and circulate experimental studies in a specific area. A booming web-driven novelty is represented by single-scholar websites, which may offer free access to the complete scientific production of an individual author.